Heart of Ice. Documentary. 77 Minutes. 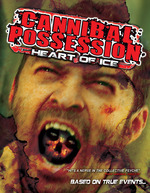 2012 (Cannibal Possession - USA Title) "A historian specializing in the cannibal legend of Wendigo is horrified when aspects of the 'Greyhound Bus' killing resembles details from an interview he did." Below are some scenes not included in the final release of Heart of Ice (or extended). When Vince Li of Edmonton brutally murdered and cannibalized a fellow passenger on a Greyhound bus bound for Winnipeg on July 30, 2008, officials stated that this was one of the most bizarrely unique murders in Canadian history. According to Edmonton based Ethno-Historian Nathan Carlson, this has happened a few times and the Vince Li murder seemed to resemble some incidents of “Windigo” from the late 1800’s a little too closely. “Windigo” is a Native North American legend that tells the frightening tale of a monster with a hunger so insatiable it consumes everything in it’s path including itself. This monster was also believed to have the ability to possess people and turn them into cannibals, which resulted in people showing symptoms being executed. Some believe that the tales of Windigo were merely a warning of an oncoming society that would damage the environment, but these warnings were taken literally with tragic results. Knowing that Vince Li delivered the Edmonton newspaper that Carlson did an interview with regarding Windigo 10 days before the murders, it’s either a possibility Li read the interview and it triggered something in his mind, or just an incredible coincidence. Either way, the Li murders are a reminder of our past and in some ways could still be a warning for the future. A literal translation of a prophecy for society as a whole by an unstable mind caused a country to question it’s own sanity. In this documentary, through recreations and interviews we’ll explore the current events within Western Canada and how they compare to the Windigo incidents of the late 1800’s. We will look into the unexplained condition of those days and into explanations of modern times as to why western Canada is still haunted by the phenomenon of “Windigo”.